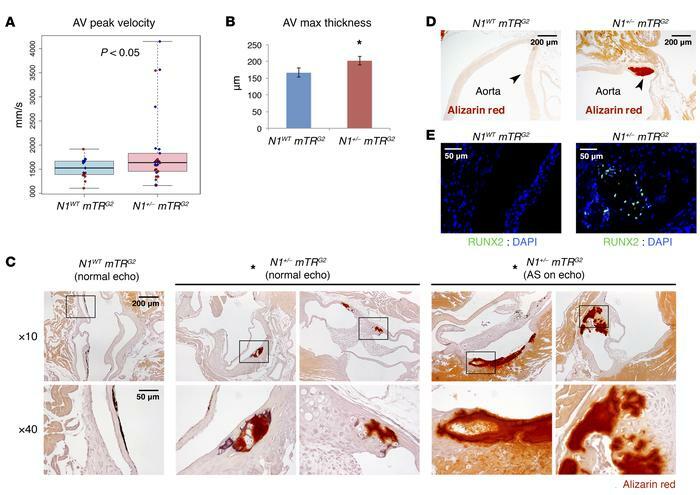 Telomere shortening elicits age-dependent AV calcification in N1+/– mice. (A) AV peak velocity by echocardiography (N1WT mTRG2, n = 15; N1+/− mTRG2, n = 26). Boxes show interquartile range (IQR); whiskers indicate range; lines indicate median. Red, female; blue, male. *P < 0.05, 1-sided t test. (B) Mean AV leaflet maximum thickness (N1WT mTRG2, n = 14; N1+/− mTRG2, n = 22). Data are shown as mean ± SEM. *P < 0.05, 1-sided t test. (C) Alizarin staining (red) of calcification in AVs (N1WT mTRG2, 0% Alizarin positive, n = 16; N1+/− mTRG2 with normal echocardiograms, 30% Alizarin positive, n = 17; N1+/− mTRG2 with AS by echocardiography, 100% Alizarin positive, n = 4). *P < 0.05, χ2 test. Boxes in upper row indicate region magnified in corresponding images in lower row. (D) Alizarin staining of calcification in aorta. Arrowheads indicate aortic wall. (E) RUNX2 and DAPI immunohistochemistry of AVs. N1+/− mTRG2 RUNX2-stained section is adjacent to bottom right Alizarin-stained section in C.